Fri., Aug. 5, 2016, 10 p.m.
SEATTLE – Sounders general manager Garth Lagerwey and Orlando City coach Jason Kreis will continue to be linked, especially during weeks in which their respective teams prepare to meet on the field, but not exclusively so. Sunday’s nationally televised showdown between the Sounders and Lions in Orlando is timely in more ways than one. Both squads have played one match under new management. The Sounders tied the L.A. Galaxy 1-1 in their first match under interim coach Brian Schmetzer, and Kreis’ Lions bested New England 3-1. The game will take place after recent conspiracy theories linking the two halves of the brain trust behind Real Salt Lake’s sustained success finally came to a head. Exactly one week after Kreis accepted the Orlando City job – having spent half a year in the coaching wilderness after being let go by New York City FC – the Sounders parted ways with longtime coach Sigi Schmid last Tuesday. Kreis had been touted on message boards as a hypothetical successor to Schmid from the moment Lagerwey joined the Sounders before last season. Kreis and Lagerwey were college teammates at Duke University and are close friends. They helped transform RSL from one of the league’s perennial cellar-dwellers into an MLS Cup champion. But as to whether the partnership would have made sense for Seattle – and whether either party was desirous of that scenario – well, Lagerwey weighed in on that after Schmid’s departure. 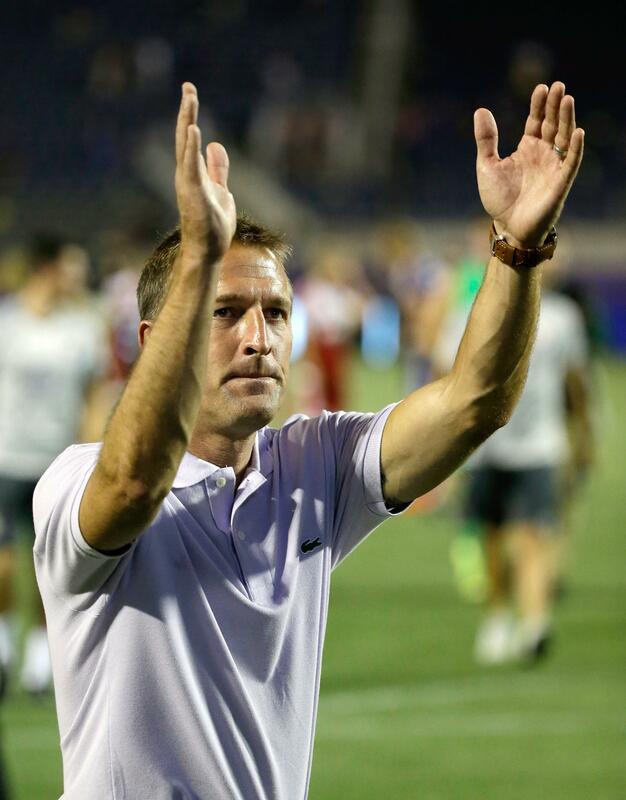 “From what I gathered from Jason, the Orlando opportunity is one he didn’t feel he could pass up,” Lagerwey said. “It’s a place where his family wanted to live. Those are really good reasons for taking a job. Would he have been on Seattle’s short list of coaching candidates had Kreis not taken the Orlando City gig? Of more pressing concern is a match that both teams badly need if either is to make a belated playoff push. Orlando is five points better off than Seattle in the overall standings but within much closer range of the postseason berths because of the relative weakness of the Eastern Conference. The Lions are on the outside of the playoff picture looking in only by virtue of New England’s superior total wins, and the Sounders are nine points out with 13 matches remaining. There’s not a whole lot for either side to glean from just 90 minutes of game film after each respective regime change, so Sunday’s match essentially is a blank slate. “Garth knows Jason pretty well,” Schmetzer said. “I’ll probably talk to him a little bit. We’ll watch the film of their game against New England. To be honest, and we totally respect every team in this league, but I want to make sure that our team is right – that our team dictates tempo to other teams, both home and away. Published: Aug. 5, 2016, 10 p.m.